It's important for law enforcement to have vehicles that fill their needs of room for gear, handling and power for driving and pursuits, and appeal to please the local citizens. Placer won an award for their current Crown Victoria paint job some time ago, but to me, it's now a little tired. Lincoln Police Department has moved on to the newest vehicle that has a design that works well as a law enforcement vehicle. This is Dodge's entry into the world of vehicles that work well as a "cop car." And, from everything I hear from Lincoln's Officers, it works better than Ford's Crown Victoria. It produces more power, better handling, and more comfort for the Officer. There is still plenty of trunk space, and the back seat has room for anyone being transported to the local lock-up. Lincoln PD is also getting great feedback from the citizens of Lincoln. I've posted past blogs about Ford's need to step it up with their Crown Victoria. 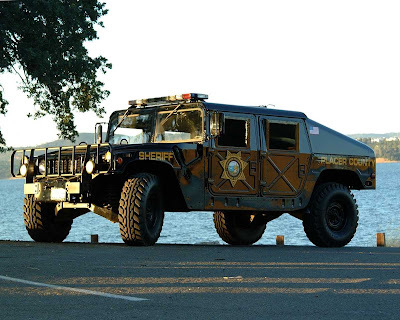 It's possible to produce a vehicle that works both as a civilian car and as a law enforcement vehicle. The Dodge Charger is proof. Why Ford has decided to stop sales of the Vic to anyone but fleet purchasers makes sense only because they can't sell it to anyone except the occasional old guy or a company/department buying in bulk. Instead of a redesign, working with both the full size vehicle consumer and law enforcement, Ford has decided to slowly phase out the Crown Victoria. In 2008, only fleet orders will result in the ability to purchase a Vic. And, if Ford follows its past trends (like the Taurus), 2008 could be the last year anyone will be able to buy a Crown Victoria. And Ford's 500 (now the new Taurus) doesn't come close to fulfilling the needs of law enforcement. So, Dodge may hit the jackpot in 2009. But, the latest stories coming from the Chrysler camp are talks of a plan to phase out cars with the Dodge brand. In fact, the total plan may include Chrysler selling only cars, Dodge selling only trucks, and Jeep selling only SUVs. Personally, I told think this is a very good plan. I would rather buy a Dodge Charger than a Chrysler 300, which are both built on the same platform. We'll see what happens. 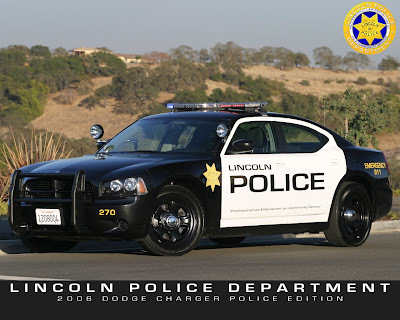 For now, I love the Lincoln PD Charger. It is currently my favorite cop car in the local area, with Auburn PD's all black logo'd Charger a close second. My wish is for Ford to produce a new rear wheel drive full size car with some power (the 5.7L V8 would do) and some handling and room upgrades. Ford does spend the most on R&D so I don't understand why they can't come up with something that works. And what about GM? They should get back in the game too. Remember the Chevy Caprice? They have a design that, with some thought, could possibly work (Pontiac G8's platform). A little work and GM could design a car that would work as a great cop car too. Well, I just need a job with one of them. But I don't see that happening anytime soon.